From the beginning, the Smart was guided by an educational mission focused on teaching and research, and by a commitment to making the arts accessible to the University community and wider public through our collection and special exhibitions. In the past decades, the Smart’s broad-based collection has expanded significantly, both through major gifts and through the initiation of an active acquisitions program. Likewise, the scope of the Smart’s mission has grown substantially. Initially run from within the art history department, the Smart gained administrative autonomy in 1983 and adopted a new focus on public outreach, first within the campus community and then throughout the city. In the 1990s, the Museum began a seminal phase of programmatic expansion, launching educational programs for local public schools as well as programs that support collaboration with faculty and the integration of the Smart’s exhibitions and collection into the University curriculum. Around the same time, our name was formally changed from the Smart Gallery to the David and Alfred Smart Museum of Art to better reflect our activities. In 1999, the Smart received a $5 million bequest from Paul and Miriam Kirkley to establish an endowment for art acquisitions. During the 2000s, pioneering exhibitions like Between Past and Future: New Photography and Video from China (2004), Echoes of the Past: The Buddhist Cave Temples of Xiangtangshan (2010), and Feast: Radical Hospitality in Contemporary Art (2012) toured nationally and internationally. Today, as in the past, the Smart remains an adventurous institution committed to exploring big ideas. Throughout 2014–2015, we used our 40th anniversary as a catalyst to reflect upon and reinvent the Smart's core practices, with a particular focus on education, interpretation, and engagement. The Smart is accredited by the American Alliance of Museums. The Museum is named in honor of brothers David (1892–1952) and Alfred (1894–1951) Smart, who built an innovative publishing business in Chicago. The brothers launched the sophisticated men’s fashion magazine Esquire in the heart of the Great Depression and followed it up with Coronet, a pocket-sized magazine with the slogan “infinite riches in a little room,” and Verve, an oversize avant-garde quarterly that featured original art by Matisse, Chagall, and Picasso. In the postwar years, they also produced short instructional movies through Coronet Films—titles like “How to Be Well Groomed,” “What to Do on a Date,” and “Are You Popular?” that shaped generations of students. The brothers established the Smart Family Foundation with a gift Esquire stock. The foundation’s first major philanthropic gift, in 1967, was to the University of Chicago to establish an art museum. Designed by architect Edward Larrabee Barnes, the Smart Museum of Art and Cochrane-Woods Art Center (home to the University’s art history department) are a set of modernist, limestone-paneled buildings centered on a shared sculpture garden. The simple design strikes a balance between academic, contemplative, and public spaces dedicated to the visual arts. In a project led by Chandra Goldsmith in partnership with UrbanLab, the courtyard was re-landscaped in 2008 and now features a quilt-like grid of natural spaces, river stones, and sculpture. So Smart. From the Start. 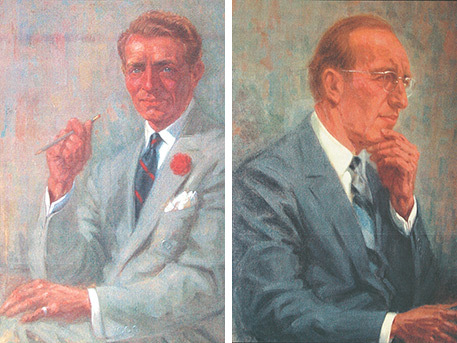 Looking back at the legacy of David and Alfred Smart and the founding the Museum. 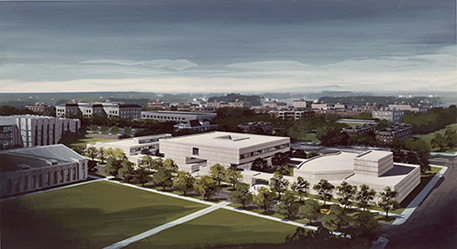 Edward Larrabee Barnes’s original design extended to the north to include facilities for music as well as the visual arts. Archival Photographic Files, apf2-01837, Special Collections Research Center, University of Chicago Library.